Dynasty Brushes are proudly manufactured by The FM Brush Company, the world’s premiere manufacturer of artist, cosmetic, craft, hobby and custom-made brushes. Originally established in 1929 by Frederick Mink, the FM Brush Company has been creating high quality brushes for over 85 years. Since then, four generations of the Mink family have led the FM Brush Company to become a global leader of brush manufacturing to leading names in multiple creative industries. The FM Brush Company is the only family run American brush manufacturer in the world. Our tradition of service and commitment to high quality production, combines to offer you an unparalleled service experience every step of the way. From concept and design to production and packaging, FM Brush maintains its attention to detail throughout the entire manufacturing process. No matter the application, FM Brush produces the finest quality handmade brushes that will exceed all performance expectations. 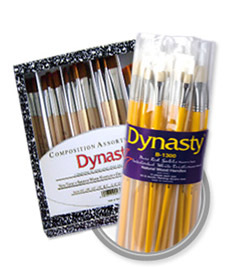 The Dynasty brand offers a wide variety of fine art brushes that are sure to fit every artist’s budget. From Red Sable Kolinsky, Quills, Symmetry, and Black Gold brushes to special value-priced Eye of Tiger, Dynasty Canister, and Faux Squirrel brushes, we have a brush that will meet all your creative needs. Our specialty brushes were created with you in mind, to offer a superior product that produces a detailed masterpiece in every stroke. As a worldwide brush manufacturer, The FM Brush Company is the premiere provider of brushes to global brands in the arts, crafts, and cosmetic industries. With two manufacturing facilities, we meet the demands of quality, quantity, timing, and price. 99% of all our products are produced in the FM Brush factories. Our quality is guaranteed. We hold over 18 international and domestic patents on brush designs. FM continues the family tradition of excellence. Look for the Dynasty® name on the handle. Whether you are interested in our synthetic paintbrushes or our watercolor paintbrushes, we hope you can find everything you need to feed your creative soul. Our paint brushes are designed to allow you to push your artistic limits by creating beautiful pieces of art that evoke feelings and dreams. If you are interested in learning more about our company or you have questions regarding our products, we encourage you to contact us today at (718) 821-5939. Experience the absolute best in Dynasty’s short handle artist brushes when you choose from the unique selection of blended synthetic brushes and natural hair artist brushes. Our watercolor painting enthusiasts enjoy the proprietary selection of the Watercolor Medley Series. The Faux Kolinsky, Faux Squirrel and Faux Sable artist brushes provide innovative synthetic blends that provide finer precision, a large amount paint holding capacity and a sensitivity of touch normally found in only natural hair artist brushes. Dynasty’s fine quality long handle artist brushes offer an expansive selection of brushes to choose for all oil, acrylic, gouache watercolor painting needs. From kolinsky red sable, interlocked white chunking bristle, golden synthetic to camel hair, black bristle, imitation sable brushes, Dynasty artist craft and hobby brushes consistently provide a high level of performance from every long handle brush produced. The Black Gold by Dynasty artist brushes represent our flagship premium quality brushes that will satisfy the unique needs of decorative painters and fine artist alike. The Black Gold brush styles and sizes available include art industry standard fans, rounds, brights, flat washes, quills and much more (in both long & short handles). The Black Gold Specialty brushes help decorative artists create unique textures and designs with just one stroke of your brush. The Black Silver by Dynasty artist brushes are available in a wide variety of individual sizes and brush styles. This proprietary mix of synthetics maintain chisel and point while holding the pigment of any paint medium (acrylic paint, oil paint or watercolor paint) with its sizable reservoir. The Black Silver by Dynasty artist brushes are a uniquely affordable multi-blended brush program that is not only durable, but also elegant for the artisan. Dynasty’s modern take on the long handle Black Steel series has the strength of bristle in a super strong synthetic. Made to push the heaviest mediums yet flexible enough to possess fluidity in stroke work. Made from a proprietary mix of synthetic materials which is blended and polished in the FM Brush factory, it is not only unique in its construction but distinctive in its appearance. 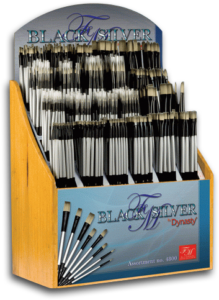 Choose from a variety of Dynasty & Black Gold Open Stock Displays to provide customers with an extensive selection of artist brush styles, brush sizes and brush hairs to purchase. We have developed and open stock program which makes fantastic quality brushes easy to refill on permanent in-store displays. These functional artist brush displays are available in wood or acrylic and will integrate nicely within your store space. Contact our sales team to get started today ! The Smartbrush™ by Dynasty® is a pull-apart art brush that works with touchscreen devices, tablets and smart phones. It is made with specially treated fibers that are conductive, which are recognized by capacitive screens and touchscreens. It is the perfect size for on the go or at home. Purchase Dynasty Brushes at These Fine Retailers!